With the recent demolition or cordoning off of three of the murder sites including the hitherto most unspoilt one, Mitre Square, this has left all Ripper tours lacking things to show clients. So last month we decided to work out a new route. But we still weren’t wholly satisfied with it, so we’ve improved it again. We now start at Whitechapel tube, close to the first (or was it the first?) 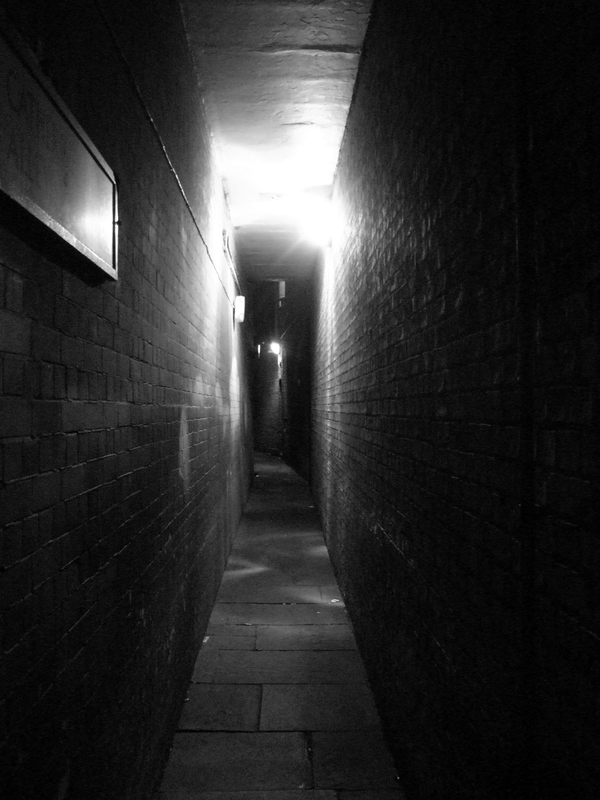 murder site, and because we take smaller numbers we’re able to take you on a new route full of old narrow streets and scary alleys that bigger walks can’t manage. And if you want to lead the way down the alley pictured here, just wear some nice loud clip-clop heels to get a good echo affect. The person with the loudest heels goes first! We show you several of the murder sites and we’re the only tour who take their clients to the Long Liz Stride murder site where the killer was almost caught. We also show you where the only clue ever found was dropped. We also see lots of things still here from those days – pubs, a night shelter, a soup kitchen and a prostitutes’ church. You’ll also see a fine array of contemporary photographs that bring the streets and people of 1888 to life.